← Conversation With…A Rickety Elevator…about finally speaking out in older age. Yes, asking questions is a lot better than sitting around frustrated about what to do with your life next while eating 400 bags of potato chips to calm your nerves. 🙂 I’m so happy you relate to this topic. HI Sue, staying true to myself is actually new for me. I’ve spent my life compromising for others in so many ways. I guess I can look at this time of life as a kind of gift, as we all can. Thanks for making me feel less alone. I loved how the question mark lobbed your questions right back at you. Amazing isn’t it how we have the answers we need all along? Nice one. Welcome back. Thanks Janet! I’m with you, I think a lot of the answers we have to questions come from within, or they’re sprinkled around in nature if we’re willing to look for them. Questions are always good. Answers might be difficult to come by, but like the question mark already knew, you have the answers. Should you decide to start a new blog, or change the topic of this one…I am sure I will be along for the ride. Aaah Anthony, it’s sooo kind of you to offer to come along for the ride if I start a new blog. I think I’ll stick with the one I have because there are probably forks Over the Hill on the Yellow Brick Road I have yet to discover and explore. Now THAT’S an expert therapist! I love going for walks! I followed your advice today and it really helped! Thanks for being there, as always. Your posts are always so clever and profound. I have no idea how you keep coming up with them. I stand in awe! Thanks Lisa! It’s my great pleasure to be on a creative journey with you. It’s really a privilege. Sometimes, well a lot of times, I will literally ask myself questions out loud when I don’t know what to do or I’m in a slump or whatever the case is. It always always surprises me when I come to an answer. It’s like I just needed to sit down and stop for a second and I realize the answer was inside me from the beginning. I feel like sometimes I am the type of person who likes to get approval from others or rather some form of assent before I do something but by asking myself, it’s almost like agreeing with myself and it helps!! As always, I love your post!!! Nice to see you back, oh Wise Old Crone of the Questions. Aaah, you are far too harsh on yourself ! I know my limits. Ha ha. Love you. I love this. Sometimes we don’t a question can answer another question better than a direct answer. So true! I have to remind myself of that when I’m really frustrated with my ridiculous behavior. I Love this…I love feeling that I’m not all alone in the craziness of growing old in a beyond bizarre world where no many stops for even a millisecond to ponder this, that or anything. Glad there’s someone out there like you to keep the flow going and the craziness at bay. So very glad you’re back. Thank you so very much, Jeanne. I find aging fascinating and frightening at the same time, and there’s something driving me to write about it and explore it. As you know, the “aging world” can be a bizarre and dark place to visit, but I want to “go there” anyway. So glad you’re with me for the ride. I get it! Been there…many, many times!!!!! Actually, I live there! Constantly questioning!!!! I have to stay busy!!!! Too busy to dwell! !l You are so interesting and oh so…creative!!!! Wish you lived close by! Find Nora Ephron’s audio tape. Put on some headphones, pour yourself a glass of wine, sit back and chill! Great suggestion, I love Nora Ephron. What’s the name of her audio tape? Is it called, “I Feel Bad About My Neck?” I’d love to check it out. A perfect therapy session. Have you thought that you may no longer need to focus on ageing? Good question! I’m sort of a masochist, so I like torturing myself in the dark world of aging. I think maybe I need to find a new path Over the Hill on the Yellow Brick Road. Maybe I’m ready to look at the positive side of growing older. In any case, I’m so glad you’re following along with me. This made me smile. 🙂 (I’ve added a smiley just in case your question mark wonders about the word ‘smile’.) I suspect we all get to that stage – the striving stops for a moment and pulls us up short. It’s jarring, isn’t it? Derrick’s question is similar to what I’m thinking… maybe now is the time to let go of the questions about ageing, and just live. By the way… many years ago I went to a therapist who drove me mad(der) echoing all my questions back at me. Pretty similar except it did nothing. Questions are much better coming from inside oneself than from other people, as you’re finding out. Hi Val, I’m finding asking questions, and just allowing for empty time without forcing myself to fill it, somehow weirdly helps. Maybe when we’re searching for a new way to approach what we were doing before, it’s okay to let our thoughts marinate in our brains and our souls for a while. Loved this! It reminded me of the Rilke quote: “Be patient toward all that is unsolved in your heart and try to love the questions themselves, like locked rooms and like books that are now written in a very foreign tongue.” So many questions…. Oh Donna! I love that Rilke quote! It’s so beautiful and says it all with a positive, wonderful spin. Thank you for sharing it with me! Wow can I relate to this one! This phase of our life can be very challenging, and one of the hardest things to deal with are the physical challenges. (If we ignore those aches and pains, we worry we’re ignoring important warning signs that something’s wrong. If we trot off the doctor to report them, we’re treated as if we are bothering them with vague and insignificant complaints.) Ultimately, I think you hit the nail on the head: we each have to find the way forward that works for us. There is not “one size fits all” ways to cope with aging. Hi Ann, I wish I could sit in the waiting room of a doctor’s office with you. We’d have a lot of laughs anticipating the doctor dreading our appointments. And you hit the nail on the head when you said the aging process is not “one size fits all.” It’s so freeing when you finally realize that, isn’t it? Aging is a booger! Just when we think we’ve got it something new takes place and shifts our perspective. Maybe if we embrace it and continue to adapt and change that’s what will keeps us young. Keeps our minds active! Everyone hits a rut once in a while…I find that you can’t really force yourself to go the way you think you’re “supposed” to go as that makes things worse. I know a lot of bloggers who have hit a rut when it comes to writing. They just lost the interest and motivation. I’ve been there, too. And at these times, sometimes it calls for a break. And that’s okay. I know there’s the nagging guilt in the back of the head saying, “You should be doing this or that.” But maybe the universe is saying, “No, you don’t have to force yourself to do something and it’s okay.” Breaks are good for refreshing and renewal. Hi Maria! Your comment made me feel so much better. I find these little emotional/creative “breaks” are challenging because you don’t know what will be at the end of the road or when you’ll get there. I guess the point is to enjoy the journey down road, every part of it. I love this! Going through our time filled with questions! Questions of self? Questions of where do I go from here! I’m glad you tried walking!! Another superb post filled with brute honesty! We will find the answers! Perhaps we already have. Are we holding onto the old, for fear of venturing out to find our true self? Perhaps THAT is the question! You have a lot of shine lady!!! Thank you so much! The questions you asked in your comment are great ones. I think part of the challenge when we venture out to find your true selfves AT A NEW POINT IN LIFE, is being ready to accept the ways others will experience us and/or accept our new ways. Love this! There always is a question to the question and we are the only ones with the answers. I have to keep moving to keep my body going strong and luckily, I love exercise and yoga. I do the weight machines at my gym and use the lightest weight. I figure if its hard then I’m working my muscles. And re yoga, I don’t pay for private lessons…no way…but my town has yoga classes at the library for very reasonable rates and most of us there are “older”. Its perfect. See what your town might have to offer….one never knows until we venture out. Keep up the great inner dialogue about self care and so glad you are writing about it. So glad you’re reading about what I’m writing about and relating to it! If you don’t mind that I’m asking, what do you do in a yoga class for older people? What makes it easier or reasonable for people who are slightly older? I’m trying to select a class and it will help to know. Thanks! Thanks Maggie! I’ll look into it! Sounds like you’re ready to move on. It’s hard when we lose our momentum no matter how old we are. I was looking at the comment from Derrick Knight and your response. I like your idea of looking at the more positive side of aging. I look forward to your next adventure. Gosh I sure enjoyed reading this. Makes me glad to be back. I could really get into a private yoga class for overly sensitive, paranoid Baby Boomers or the one pound weights. I can relate to the random aches and pains for no reason I am aware of. Thankfully they come and go away for a while. And knowing my body can still heal helps. I fell off my bike a couple weeks ago (after not having ridden it in ages) and have been fascinated by watching my badly skinned knee heal. I understand. I’m hesitant about some things. I would like to go rock climbing but might have to let that go or train a lot to work up to it. Can’t go charging out there like the old days. Swimming and yoga might be enough. Little steps. Little stretches. Your last four words are so meaningful…”little steps, little stretches.” I think that’s key. I’m constantly asking myself a lot of questions and I’m only 51 years old. I sometimes feel like I have a hamster in my head. It does not create anxiety for me because the questions are more related to my creativity than to life problems. The expectation of answers frustrates me though coz I am not a very patient person. I think asking ourselves questions is not so much related to age but rather to our personality and the nature of our work. For my part, this is the case at least. With age, however, I learned to calm my mind so I could listen to the silence, realize that I am here now. I walk every day and breathe deeply. It is in these moments of relaxation that I usually find the answers to my questions. 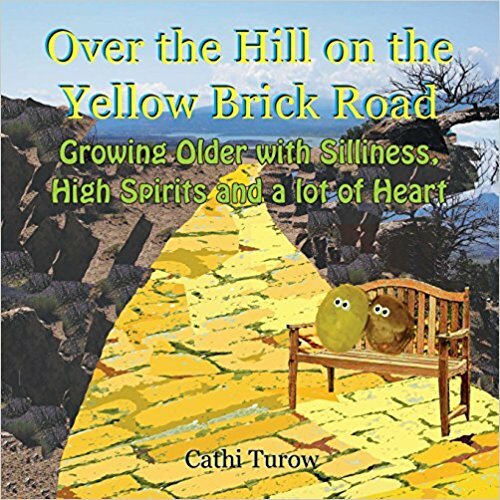 Great read Cathi. You are a very smart and intuitive person. I have the feeling you will always find the answers you are searching for within yourself. Holy, smokes, you hit a hot topic! You’re on fire, and ready to start again, that’s great! Remember there are two sides to a rut, the one you crawl down and the one you crawl out of. This time in life is full of looking back down at the rut instead of looking at how we’ve grown out of the rut. You’ll get there, and you’re in great company, just look at all the support! It’s nice to see you writing again, I’ve missed reading your conversations! Hang in there!! Hi! Can you please cut and paste in the comment section the exact post you’re referring to? I’m not sure which post you mean. Thanks! Also, I’m in the midst of reading your book and really enjoying it!!!! I absolutely will as soon as I finish reading the book! I was wondering why you haven’t written for a long time and so came over to your home page and found this brilliant piece of writing. Wonder how i missed reading this the day it was published! ? But the truth is it’s only by asking questions that you find answers . It’s all about asking the right questions at the right time . And through framing those questions and reading out our questions aloud , we find the answers ourselves . Like I have written in one of blogs earlier, when we have the questions ready, the answers appear from the universe in different ways . So all the best cathi. You have embarked on that journey . I know you’ve been having a wonderful time answering questions in your recent blog posts. Questions create a velvet path that leads us to higher places. Glad we can enjoy our journeys together. Truer words were never spoken–the Question Mark has given you a lot to think about, and you’ve passed all of it to us, your readers. As a fiction writer, my entire job description is to raise a lot of questions, and answer only a few. As a writer, that’s a great strategy. Sometimes asking questions can also prevent writers’ block. I can totally relate. I have been feeling stuck for a long time now and am not sure what the answer is. kind of a restless feeling. I hope we both find the answer to our questions. I’m glad you’re part of the process with me! I have a feeling we will find our answers soon. I sort of know how you feel. There was a time I felt so strongly inspired and I feel lately that I have been avoiding. I am trying to get back to it. I finally posted today after a long absence. I have loved all your writing an d look forward to it. There is always something new happening in life and your perspective and eloquent way of addressing is always fresh. I wanted to ask, did you say some time ago that you had put your works into a book? I think it would make a wonderful Christmas gift for a friend who just retired. Can you let me know? I’m looking forward to seeing new posts from you, and I’m excited and delighted you feel your friend will enjoy my book! That means the world to me. It’s been a while. Just checking on you…. I was glad that Linda asked – I hope you are doing well… and sometimes it’s a good thing to take a breather. Who knew that blogging can be so complex – I know I didn’t Cathi and ever day I learn even more that I’m not doing that I should be doing 🙂 Merry Christmas and Happy Holidays – I hope you are having fun! hugs! Thanks for understanding, Joan! I wish you very happy holidays as well! Lots of hugs back to ya!